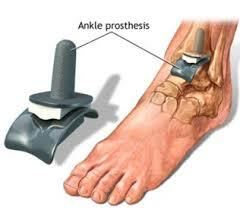 A total ankle replacement procedure involves replacing damaged cartilage and bone with prosthetic components. Prosthetic components used in ankle replacement are made from a range of materials including metal, ceramic, and plastic. Unfortunately the indications for ankle replacement are more reduced compared to the hip, knee and shoulder replacement with another surgical option being an ankle fusion. Osteoarthritis, also known as degenerative arthritis, causes the cartilage that covers the bone to wear away, decreasing the protective space between the bones. This causes stiffness, swelling and pain, and is most common in people over the age of 50. 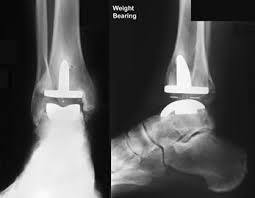 When performing ankle replacement surgery, your orthopaedic surgeon will remove the worn out joint surfaces and replace them with 2 pieces of metal with a piece of hard plastic between them that allows the joint to move freely. You need to see a physiotherapist after your surgery to regain an adequate range of motion and reduce swelling. It will take some time for you to become fully mobile after your surgery– it is important to take time to heal properly. Your recovery time will depend on your condition.